Nannoliths are heterogeneous morphological suites of biogenic carbonate particles with silt-clay size dimensions. They are mainly composed of coccoliths, a suite of calcite complex structures produced by marine coccolithophores belonging to the Haptophyta microalgae division. Coccoliths can be found in marine and coastal facies, and they are used as a palaeoenvironmental proxy and a marine tracer in coastal sediments. Among microscopic biogenic structures commonly observed in tsunami deposits, diatoms are often used to determine the marine provenance and sediment source, but very few investigations about nannoliths were carried out so far. In this paper, we investigate the abundance, distribution and provenance of nannoliths observed in the 2004 tsunami deposits near Lhok Nga (northwest Sumatra, Indonesia) and their implications in terms of sediment sources and flow dynamics. The 2004 tsunami deposits display abundances in nannoliths that are significantly higher (1.0 x 104 to 7.2 x 104 nn/g) than other coastal deposits (4.5 x 103 nn/g), but lower than innershelf deposits (1.3 to 6.9 x 105 nn/g). Such enrichments in nannoliths could represent a tool to recognize palaeo-tsunami deposits. A remarkable characteristic of the Lhok Nga tsunami deposits is their nannolith coastal assemblages despite their relative impoverishment in clay content, which under normal marine hydrodynamic conditions would prevent nannoliths to settle. The abundance of nannoliths in tsunami deposits tends to decrease landward and upward, despite variations due to successive erosion/sedimentation phases by successive waves, and to topographical effects. When coupled with grain-size analyses, the study of vertical trends of nannolith abundances thus represents a complementary data for interpreting tsunami deposits. Les nannolithes sont un ensemble hétérogène de squelettes calcifiés de la taille des limons et argiles. Ils sont principalement composés de coccolithes, structures calcitiques complexes produites par les coccolithophores marins appartenant à la division des algues microscopiques Haptophyta. Les coccolithes étant présents en milieu océanique mais aussi côtier, ils peuvent être utilisés comme marqueurs paléoenvironnementaux et comme traceurs marins dans les sédiments côtiers. Parmi les structures microscopiques biogéniques généralement observées dans les dépôts de tsunami, les diatomées sont couramment utilisées pour déterminer l'origine marine et les sources sédimentaires mais très peu de travaux ont été réalisés sur les nannolithes. Cet article présente des données concernant l'abondance, l'origine et la répartition des nannolithes dans les dépôts du tsunami de 2004 à Lhok Nga (nord-ouest Sumatra, Indonésie), et les implications en termes de sources sédimentaires et d'hydrodynamique. Les dépôts du tsunami de 2004 présentent des abondances en nannolithes significativement supérieures (1,0 x 104 à 7,2 x 104 nn/g) aux autres sédiments côtiers du même secteur (4,5 x 103 nn/g) mais inférieures à celles des sédiments de plateforme péri-continentale (1,3 à 6,9 x 105 nn/g). Cet enrichissement en nannolithes pourrait donc représenter un outil de reconnaissance des paléo-tsunamis. La présence de nannolithes dans les dépôts du tsunami à Lhok Nga est singulière quand on considère leurs caractéristiques granulométriques grossières et leurs conditions de mise en place, peu favorables au dépôt des nannolithes. Cette relative abondance des nannolithes dans les dépôts du tsunami tend à décroître vers les terres et de bas en haut des coupes analysées, malgré les variations liées aux phases d'érosion et de sédimentation par les vagues successives et aux effets topographiques. L'étude de la distribution verticale des nannolithes, couplée aux analyses granulométriques, représente une source d'information complémentaire pour l'interprétation des dépôts de tsunami. 1Estimate the magnitude (or “size”) of past tsunamis after their deposits is one of the major issues to be developed in studies on tsunami hazard assessment. Main limitations are (i) the great variability of tsunami sandy sheets deposited inland (the sediment source and the topography controlling many aspects of the deposition), (ii) the preservation of these soft sediments, and (iii) the distinction between tsunamis and other coastal depositional events (e.g., storms, hurricanes, seiches). A suite of diagnostic characteristics allows palaeo-tsunami deposits to be identified: they are locally extensive and generally finer landward and upwards (from base to top of the sections); distinct upper and lower sub-units can be identified; the lower contact is unconformable or erosional; the clast size varies from boulders to fine silt; there are fossil-rich sub-units (coral and shell fragments); rip-up clasts of reworked material can be found (e.g., soil, roots, wood, debris); clasts fabrics and laminasets may indicate landward, seaward and oscillatory palaeocurrents. These criteria have been confirmed and discussed through recent works on the December 26, 2004 tsunami deposits in Indonesia, Thailand, Sri Lanka and India (e.g., Bahlburg and Weiss, 2006; Goff et al., 2006a; Moore et al., 2006; Hori et al., 2007; Paris et al., 2007; Srinivasalu et al., 2007; Wassmer et al., 2007; Choowong et al., 2008 a and b; Morton et al., 2008).Nevertheless, tsunami sandy deposits analysed for one single event but in distinct areas may display the same grain-size trends and thickness, even if flow depths and velocities were completely different. Indeed, the sediment source and the topography control many aspects of the deposition inland: thickest deposits in the topographic lows, great spatial variations in thickness and upper laminated texture when the sedimentation was limited by steep slopes, very poor sorting and landward coarsening at the wave breaking line, bimodal or plurimodal grain-size distributions reflecting different sources of sediment (e.g., Nanayama and Shigeno, 2006; Paris et al., 2007; Choowong et al., 2008 a and b).Among microscopic biogenic structures commonly observed in tsunami deposits, diatoms are often used to determine the marine provenance and sediment source (e.g., Dawson, 2007), but few investigations about calcareous nannoplankton and other nannoliths were carried out so far (Andrade et al., 2003). Nannoliths are heterogeneous morphological suite of biogenic carbonate particles with silt-clay size dimensions. They are mainly composed of coccoliths, a suite of calcite complex structures produced by marine coccolithophores belonging to the Haptophyta microalgae division (Winter and Siesser, 1994; Billard and Inouye, 2004). In coastal facies, smaller-sized aragonite spicules of particular colonial ascidians can also be present, where most stellar-shape forms belong to the Didemnidae family (Monniot, 1970; Turon, 1986). Coccoliths are one of the main components of deep ocean carbonate oozes (Baumann et al., 2004; Ziveri et al., 2004). However, this group can also be found in coastal facies and thus is used as a palaeoenvironmental proxy and a marine tracer in coastal sediments (Ferreira and Cachão, 2005; Guerreiro et al., 2005; Alday et al., 2006, Drago et al., 2006). In this paper, we investigate the abundance, distribution and provenance of nannoliths observed in the 2004 tsunami deposits near Lhok Nga (northwest Sumatra, Indonesia) and their implications in terms of sediment sources and flow dynamics. 2The Lhok Nga Bay is a 5 km large coastal embayment (25 km²) opened to the west and delimited by calcareous steep slopes (fig. 1). The coast prior to the 2004 tsunami appeared as a continuous beach, breached by small estuaries during the wet season. Main fringing reefs are located between Lampuuk and the Lhok Nga River. The lowest areas correspond to lagoons, swamps and rice crops. Small hills and hummocky terrains refer to dunes, beach ridges and palaeo-dunes reaching 15 m a.s.l. (e.g., Lampuuk, Lam Lho). In the southern part of the bay, the coastal morphology becomes more contrasted, especially south of the harbour, where the coast shows alternating cliffs and flat crescent-shaped bays and creeks.The December 26, 2004 tsunami in Sumatra was one of the largest tsunamis in recorded human history. In Lhok Nga, the tsunami waves were almost 30 m high and runups reached 51 m a.s.l. (Lavigne et al., 2009). Eyewitnesses reported 10 to 12 waves, the second and third ones being the highest. The sea was observed to recede 10 mn after the earthquake and the first wave came from the southwest a few minutes later. The first wave moved rapidly landward as a turbulent flow with depths ranging from 0.5 to 2.5 m from ground. The second and largest wave (i.e., the tsunami bore) came from the west-southwest within 5 mn after the first one and was 15-30 m high at the coast. Few eyewitness’ accounts are available for the outflow (backwash). Both inflow and outflow produced extensive erosion, sediment transport and deposition until 5 km inland (Umitsu et al., 2006; Wassmer et al., 2007; Paris et al., 2009). The erosional imprints of the tsunami extend to 500 m from the shoreline and exceed 2 km along the river beds. The most eroded coasts were tangent to the tsunami wave train, which came from the southwest. The fringing reefs were not efficient in reducing erosion and destruction inland (Baird et al., 2005). R. Paris et al. 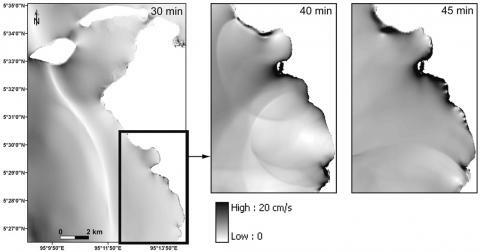 (2009) estimated that the volume of beach eroded by the tsunami (ca. 1.5 x 105 m³) represents less than 10% of the sediments deposited inland (ca. 1.5 x 106 m³).The sandy deposits laid down by the tsunami inland record the successive inflows and a final outflow (the backwash), as shown by normally graded couplets or triplets of layers (Moore et al., 2006; Paris et al., 2007). The topmost layers, interpreted as the backwash deposition, describe a seaward sequence of increasing mean grain size and decreasing degree of sorting. Composition of the deposits and plurimodal grain size distribution reflect different sources of sediments. The local effects of the topography on depositional conditions could be identified: thickest deposits in the topographic lows (50-80 cm), large-scale spatial variations in thickness and upper laminated texture when the sediment accretion was limited by steep slopes (oscillations), flame structures in the riverbeds, landward coarsening and very poor sorting at the wave breaking point. The tsunami was also able to detach and transport coral boulders in excess of 10 t over 500-700 m and megaclasts from the tidal flat in excess of 85 t over a few metres (Paris et al., 2009). The coincidence of different size modes, from boulders to fine sands suggests that all the material was not transported in suspension, but rather through a combination of rolling, saltation and suspension.The 2004 tsunami deposits in Lhok Nga are particularly rich in bioclasts: coral fragments, coral and sponge triaxones spicules, rhodophyta calcareous algae, nannoliths, diatoms, benthic foraminifers, gastropods, echinoderms and rare bryozoans (Paris et al., 2007). These faunistic and floristic species are typical of a shallow marine environment. Fig. 1 – Location of the Lhok Nga Bay and samples collected for analysis of nannoliths. Fig. 1 – Carte de localisation de la Baie de Lhok Nga et des échantillons récoltés pour l'analyse des nannolithes. Method for the construction of bathymetry (5-m dashed contour lines) and topography (10-m contour lines) is presented in F. Lavigne et al. (2006, 2009). La méthode de réalisation de la bathymétrie (équidistance 5 m, isobathes en pointillés) et de la topographie (équidistance 10 m) est présentée in F. Lavigne et al. (2006, 2009). where κ is the Prandtle constant (κ≈ 0.4), z is the height above the bed (in cm), zo is the roughness length (0.5 cm for irregular or rippled bed of sand or gravel), ρs is the density of the boulder (in kg/m³ or g/cm³), ρwis the water density (ρw = 1.025 g/ml for sea “clear” water), g is the gravitational acceleration (g = 9.8 m/s²) and v is the sea water viscosity at 25°C (0.00896 m²/s).We thus illustrate the relationship between the critical threshold shear velocity (u*cr) of a specific grain size (D) and the simulated tsunami shear velocity (u*) each 5 mn of simulation. Sediment transport occurs when u* > u*cr. We calculated and compared the critical threshold shear velocities of specific grain sizes and the simulated tsunami shear velocities using an 18 m bathymetric grid realised in December 2005 (Lavigne et al., 2006). Tsunami flow velocities were extracted from a numerical simulation by A. Loevenbruck et al. (2007). 4The 2004 tsunami deposits in Lhok Nga are although almost silty-clay void coarse bioclastic sands. However, they revealed the presence of nannoliths (present day coccoliths and Ascidian spicules), with abundances between 1.0 and 7.2 x 104 per grams(data matrix available at http://mcprojectos.fc.ul.pt/​papers/​Lhok_Nga/​Lhok_Nga_nanno.pdf). These values are one order of magnitude lower than the innershelf present-day sediments off Lhok Nga (from 1.3 to 6.9 x 105 nannoliths per grams). Highest abundance was found in sample LAG6 of the Lampuuk lagoon (8.5 x 105 nn/g). Large amounts of sediment were trapped in this lagoon during the tsunami outflow (or backwash) because the fringing reef acted as a topographical barrier. Sediments collected in LAG6 are medium sand rich in bioclasts, and numerous fragments of centimetric Acropora coral branches. Beach samples have expectable low abundance of nannoliths (ca. 4.5 x 103 nn/g), while bryozoan fragments (fig. 2: images 26-29) and ascidian spicules (fig. 2: images 16-25) are, comparably, more abundant. There is no difference between pre-tsunami (4.4 x 103 nn/g) and post-tsunami beach samples (4.5 x 103 nn/g). Tsunami deposits sampled close to the beach have abundances of nannoliths ten times higher (2.19 x 104 nn/g for NGA4). Simple nannolith diversity (number of distinct non-reworked present day taxa) varies in relation with abundance (r = 0.65). Highest diversities were found for samples NGA-7A and LAG 6, with values similar to diversities obtained for the neritic samples (>10). Fig. 2 - Nannoliths observed in the 2004 tsunami deposits of the Lhok Nga Bay(calcareous nannoplankton, ascidian spicules, bryozoa fragments and reworked calcareous nannofossils). Fig. 2 – Nannolithes observés dans les dépôts du tsunami de 2004 dans la Baie de Lhok Nga (nannoplancton, spicules d’ascidies, fragments de bryozoaires et nannofossiles calcaires remaniés). All images are at the same magnification (scale bar = 5 mm) and taken under cross nicols. 1-6: Gephyrocapsa oceanica (1: sample NGA 2A; 2: sample NGA 7A; 3: sample NGA 8; 4: sample NGA 18; 5: sample LAG 6; 6: sample LAG 8). 7: Gephyrocapsa ericsonii (sample NGA 7A). 8: Umbilicosphaera sibogae (sample NGA 7A). 9-11: Helicosphaera carteri (9: sample NGA 7A; 10: sample NGA 18; 11: sample LAG 6). 12-15: Helicosphaera wallichii (12-13: sample NGA 2D; 14-15: sample LAG 6). 16-25: Ascidian spicules (16-17: distinct focal planes, sample NGA 7A; 18: sample NGA 18; 19: sample LAG 6; 20-21: distinct focal planes, sample LAG 6; 22-23: distinct focal planes, sample LAG 6; 24-25: sample LAG 8). 26–29: isolated fragments of Bryozoan carbonate skeleton (sample NGA 9A). 30–31: reworked calcareous nannofossil (Dictyococcites) (30: sample NGA 7A; 31: sample NGA 18). 32: reworked calcareous nannofossil (Watznaueria; sample NGA 2B). Toutes les images sont prises au même grossissement (échelle 5 mm). 1-6 : Gephyrocapsa oceanica (1 : échantillon NGA 2A ; 2 : échantillon NGA 7A ; 3 : échantillon NGA 8 ; 4 : échantillon NGA 18 ; 5 : échantillon LAG 6 ; 6 : échantillon LAG 8). 7 : Gephyrocapsa ericsonii (échantillon NGA 7A). 8 : Umbilicosphaera sibogae (échantillon NGA 7A). 9-11 : Helicosphaera carteri (9 : échantillon NGA 7A ; 10 : échantillon NGA 18 ; 11 : échantillon LAG 6). 12-15 : Helicosphaera wallichii (12-13 : échantillon NGA 2D ; 14-15 : échantillon LAG 6). 16-25 : spicules d'ascidie (16-17 : échantillon NGA 7A ; 18 : échantillon NGA 18 ; 19 : échantillon LAG 6 ; 20- 21 : échantillon LAG 6 ; 22-23 : échantillon LAG 6 ; 24-25 : échantillon LAG 8). 26-29 : fragments isolés de squelette carbonaté de bryozoaires (échantillon NGA 9A). 30-31 : nannofossile calcaire remanié (Dictyococcites ; 30 : échantillon NGA 7A ; 31 : échantillon NGA 18). 32 : nannofossile calcaire remanié (Watznaueria ; échantillon NGA 2B). 5Gephyrocapsids, namely Gephyrocapsa oceanica, a distinct feature of coastal nannolith thanatocoenoses, dominate in all samples (Okada, 1983; Ferreira and Cachão, 2005; Guerreiro et al., 2005). This is corroborated by much less diversity than the oceanic (Indian Ocean) realm (see Andruleit, 2007), lower abundances of small placoliths (Emiliania huxleyi + Gephyrocapsa ericsonii), and the occurrence of ascidian spicules (Alday et al., 2006; Turon, 1986). On the other hand, the common presence of Umbilicosphaera sibogae (fig. 2: image 8) is indicative of warm water assemblages (Winter and Siesser, 1994). Small quantities of reworked forms, mainly Neogene (Dictyococcites, Sphenolithus, Reticulofenestra) and in lesser degree Cretaceous (Watznaueria), were detected which indicatives active processes of erosion from Mesozoic and Cenozoic nearby outcrops (fig. 2: images 30-32). The apparent correlation between extant and reworked forms seems to indicate that the latter were present inside the surface sediments before the 2004 tsnami and not preferentially eroded during the tsunami itself. The coastal and shallow-water signature of the nannoliths observed indicates that there is not an increase of open-ocean over coastal taxa brought by the tsunami. 6Nannoliths, together with other marine biogenic elements (tests of small planktonic foraminifera, sponge spicules, bryozoa colony fragments), could be traced along the 3.5 km long NGA transect in the northern part of the Lhok Nga Bay and compared to samples LHO in the southern part (Paris et al., 2007). LHO3 deposits display abundance (1.4 x 104 nn/g) in the same order of magnitude than NGA samples, but LHO4 has low to very low abundances (from 0 to 4.9 x 103 nn/g). Along the NGA transect (fig. 3), the mean abundances from the shore to 1 km inland are quite high, but remain variable from one site to another (from 1 x 104 nn/g to 5 x 104 nn/g), and then decrease landward (< 2 x 104 nn/g). This longitudinal trend is also observed for the CaCO3 content. Samples NGA 2 to NGA 12 (< 1 km inland) contain more than 25% of carbonates (26-57%), whereas NGA 14 to 18 (from 1.5 km to 3.5 km inland) have less than 25% (3-25%). 7Nevertheless, abundances are highly variable when considered in vertical sections of tsunami deposits. 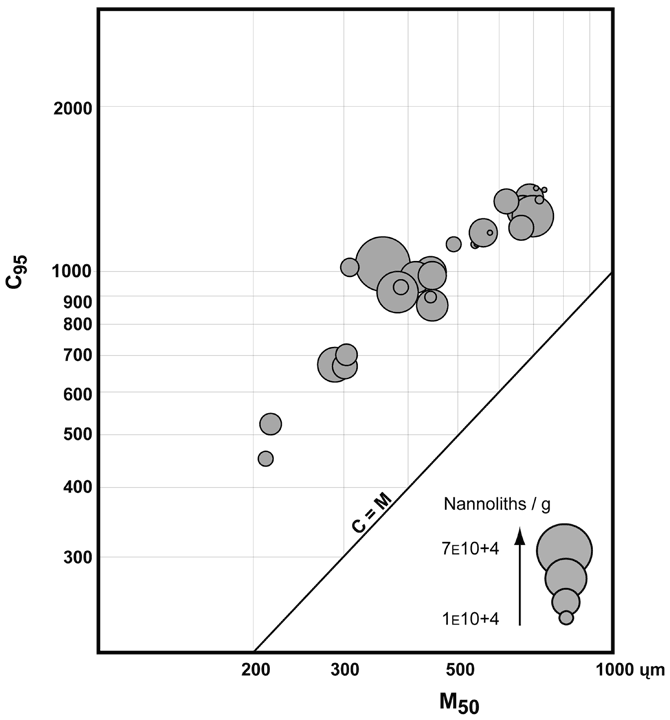 The vertical distribution of nannoliths and the CaCO3 content are not clearly correlated with other sedimentological trends (e.g., thickness, mean size, sorting). Sections NGA2 and NGA 7 (fig. 4) are located respectively 175 m and 330 m from the shore, on the banks of brackish lagoons scoured by the tsunami. These sections thus represent a complete sediment record of the event. R. Paris et al. (2007) used successions of normally graded couplets or triplets of layers to identify the signature of successive waves. Deposits of the first wave were eroded by the subsequent waves, except in some topographic lows (e.g., NGA2-A at 52 cm deep). For both sections, the carbonate content decreases upward, with a slight increase at the arrival of the third wave (NGA2-E and NGA7-D). The second and main wave (i.e., the tsunami bore) is recorded by three layers fining upward (NGA2-B-C-D and NGA7-A-B-C). A first decrease of the number of nannoliths is rapidly followed by a significant increase (NGA2-D and NGA7-C). Same trend occur from NGA7-D and NGA 7-F (third wave? 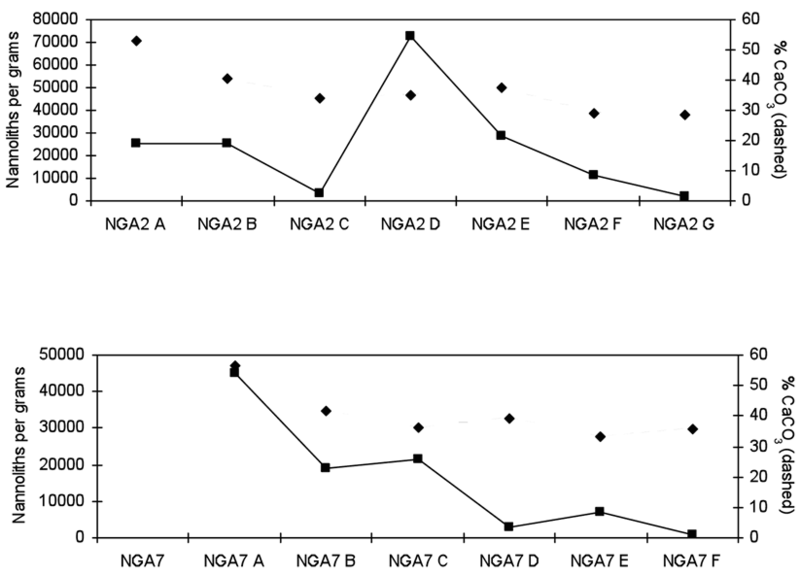 ), but with lower abundances, whereas the second decrease upward is continuous along NGA2 section. Finally, the two sections both display a two-phase distribution of nannoliths, but peaks of abundance appear at the beginning of the second phase for NGA 2 (7.2 x 104 nn/g at NGA2-D) and at the beginning of the first phase for NGA 7 (4.5 x 104 nn/g at NGA7-A). A similar vertical trend is observed for section NGA9, located 475 m inland. Fig. 3 – Abundance of nannoliths and thickness of the 2004 tsunami deposits near Lampuuk (northwestern coast of Sumatra). Fig. 3 – Quantité de nannolithes et épaisseur des dépôts du tsunami de 2004 près de Lampuuk (côte nord-ouest de Sumatra). Fig. 4 – Variation of the abundance of nannoliths along cross-section of the 2004 tsunami deposits near Lampuuk (northwestern coast of Sumatra). Fig. 4 – Variation verticale de la quantité de nannolithes dans les dépôts du tsunami de 2004 près de Lampuuk (côte nord-ouest de Sumatra). 8The sediments analysed in this study display nannoliths despite being relatively poor in the silty-clay fraction. Under normal conditions silty-clay poor coastal marine sediments are associated to wave hydrodynamic shore conditions that also prevent nannoliths to settle, what was denominated the High energy gap (Ferreira and Cachão, 2005). Coastal sediments off Lhok Nga, retrieved from 12 m to 18 m water depth, contain significant amounts of nannoliths, which indicates that the High energy gap, if present at Lhok Nga shore, corresponds to water depths less than 10-12 m. Furthermore, unconsolidated silty-clay poor sediments are highly permeable, tending to become rapidly washed out of nannoliths through the percolation of meteoric water. Thus, from a taphonomical and textural point-of-view, a nannolith signature can only be retained by the more clay-rich tsunami deposits. Nannoliths in coarse sediments tend to disappear over time. This reinforces the uniqueness and transitional nature of the newly deposited nannolith assemblages of the Lhok Nga sediments. From a compositional point-of-view, the Lhok Nga sediments are not significantly susceptible of early diagenetic carbonate dissolution by acid waters, due to their biogenic rich carbonate content. However, other tsunami deposits, when mainly constituted of siliclastic sediments (on non-tropical coral reef regions) may experience strong and fast post-depositional carbonate dissolution, particularly for the smaller aragonite spicules. This may also prevent calcareous nannofossils to become registered over time in sediments associated to tsunamis. 9Three other topics need to be discussed: the provenance of the nannoliths observed in the 2004 tsunami deposits and the implicationsin terms of sediment sources; the variations of nannolith abundances related to the morphological setting; the trends of nannolith and carbonate contents along vertical sections.The 2004 tsunami carried a large amount of sediments and debris. Eyewitness accounts recall waves already of black colour before breaking inland (Lavigne et al., 2009). The simulation of threshold shear velocities (fig. 5) confirms that most of the sediments deposited inland came from offshore. Bathymetry off Lhok Nga displays a 20 km large continental shelf that provided great volumes of sediments (fig. 6). In a previous contribution (Paris et al., 2009), we estimated that the volume of beach eroded by the tsunami (ca. 0.15 x 106 m³) represented less than 10% of the sediments deposited inland (ca. 1.5 x 106 m³). Nevertheless, the coastal and shallow-water signature (< 60 m) of the nannolith communities indicates that there is not an increase of open-ocean over coastal taxa brought by the tsunami. Despite high shear velocities of the tsunami over the oceanic basins, the continental talus may have limited sediment transport upward, from the Aceh basin (2700-2300 m deep) to the fore arc shelf (depth < 200 m).Furthermore, the great majority of the nannoliths left inland must have been emplaced and transported by the second and main wave, the impact of the subsequent waves being limited to surface reworking. This is concordant with the upward decreasing abundances observed along the thickest vertical sections. The low abundance of nannoliths in LHO4 samples is probably related to the morphological setting of this area (southern part of the Lhok Nga Bay), where the tsunami runup was limited by steep slopes near the coast. Deposition occurred under oscillatory currents and finest materials were constantly reworked by the successive waves, and then redeposited offshore by the backwash. The morphological setting also explains some vertical trends in abundances of nannoliths, by modifying bottom frictions and roughness, sediment transport modes, and by creating sediment traps. 10We suggest that pulses of nannolith abundance are related with successive waves, rather than with transport modes within each wave. When plotted on a CM diagram (Passega, 1964; Allen, 1971), tsunami samples appear to have been deposited by rolling (bed load) and graded suspension (fig. 6). Rolling is the predominant transport mode. This is also supported by the observed breakages of sedimentation related to gentle slope breaks (e.g., road to Lampuuk at 1 km from the shore), and by the association of sands and boulders deposited simultaneously. Graded suspension occurs during transition phases between successive waves. When coupled with CM patterns (fig. 6), nannolith and carbonate contents are not significantly different from graded suspension to rolling modes. Layers with peaks of nannolith abundances (e.g., NGA2-A, 7-A and 9-A) do not have systematically the same grain-size characteristics. Fig. 5 – Maps of threshold shear velocity values (u*) calculated for the 2004 tsunami off Lhok Nga. Fig. 5 – Cartes des vitesses de cisaillement critique (u*) calculés pour le tsunami de 2004 au large de Lhok Nga. Low values appear in blue and high values in red. 30 mn after the main earthquake, the tsunami wave train approaches Lhok Nga. u* values are already high enough (> 0.5 cm/s) to mobilize submarine sediments (u*cr of very coarse sands is ≈ 0.3 cm/s). At 40-45 mn, the tsunami has invaded the Lhok Nga Bay and high values of u* (10-20 cm/s) are observed at the coast, especially around the fringing reef in Lampuuk. Les faibles valeurs apparaissent en bleu et les fortes valeurs en rouge. 30 mn après la secousse sismique principale, le train d'onde approche de Lhok Nga. Les valeurs de u* sont déjà suffisamment élevées (> 0,5 cm/s) pour mobiliser des sédiments au fond (u*cr pour des sables grossiers ≈ 0,3 cm/s). Au bout de 40-45 mn de simulation, le tsunami a envahi les terres et de fortes valeurs de u* (10-20 cm/s) sont observées à la côte, surtout autour du récif frangeant de Lampuuk. Fig. 6 – CM patterns and nannolith abundances of the 2004 tsunami deposits in Lhok Nga. Fig. 6 – Images CM et abondances en nannolithes des dépôts du tsunami de 2004 à Lhok Nga. M50 corresponds to the median and C95 to the fifth coarsest percentile (Passega, 1964; Allen, 1971). M50 représente la médiane et C95 le 5e percentile plus grossier (Passega, 1964 ; Allen, 1971). 11The 2004 tsunami deposits in Lhok Nga display abundances in nannoliths that are significantly higher than other coastal deposits, but lower than innershelf deposits. Our study clearly suggests that such enrichments in nannoliths may be used as a tool to recognize palaeo-tsunami deposits. Nannolith preservation in sedimentary deposits is normally a function of their sediment texture and composition. A remarkable characteristic of the Lhok Nga tsunamigenic sediments is their nannolith coastal assemblages despite their relative impoverishment in clay content, which under normal marine hydrodynamic conditions would prevent nannoliths to settle. The abundance of nannoliths in the 2004 tsunami deposits tends to decrease landward and upward, despite variations due to successive erosion/sedimentation phases by successive waves, and to topographical effects. When coupled with grain-size analyses, the study of vertical trends of nannolith abundances thus represents complementary data and evidence for interpreting tsunami deposits. However, more investigations are needed to explain why pulses in sediment mean size, sorting and nannolith contents do not appear simultaneously. After this preliminary study, nannoliths appear as a useful tool in determining the marine provenance and sediment source of tsunamis. Samples analysed should systematically encompass abyssal to coastal zones, especially for large-magnitude tsunamis having high values of threshold shear velocities. The results presented in this paper need to be confirmed by future investigations on other tsunamis, with distinct magnitudes, other high-energy events (e.g., storms, hurricanes), and in different morphological and climatic settings. Funding came from the Délégation Interministérielle pour l'Aide Post-Tsunami (DIPT, project no. 161), the French Embassy in Indonesia and the Centre National de la Recherche Scientifique (CNRS) in France, in the framework of Tsunarisk and ATIP projects coordinated by Franck Lavigne and Raphaël Paris. We are particularly grateful to Pauline Agnew and Johannes Steiger, who corrected the manuscript. Alday M., Cearreta A., Cachão M., Freitas M.C., Andrade C., Gama C. (2006) – Micropaleontological record of Holocene estuarine and marine stages in the Corgo do Porto rivulet (Mira River, SW Portugal). Estuarine, Coastal and Shelf Science 66, 532-543. Allen G.P. (1971) – Relationships between grain size parameter distribution and current patterns in the Gironde estuary (France). Journal of Sedimentary Petrology 41, 1, 74-88. Andrade C., Freitas M.C., Miranda J.M., Baptista M.A., Cachão M., Silva P., Munhá J. (2003) – Recognizing possible tsunami sediments in the ultradissipative environment of the Tagus estuary (Portugal). Coastal Sediments’03 – The fifth International Symposium on Coastal Engineering and Science of Coastal Sediment Processes, 18 - 23 May, Clearwater Beach, Fl., CD-ROM edition: 14 p.
Andruleit H. (2007) – Status of the Java upwelling area (Indian Ocean) during the oligotrophic northern hemisphere winter monsoon season as revealed by Coccolithophores. Marine Micropaleontology 64, 36-51. Bahlburg H., Weiss R. (2006) – Sedimentology of the December 26, 2004 Sumatra tsunami deposits in eastern India (Tamil Nadu) and Kenya. International Journal of Earth Sciences 96, 6, 1195-1209. Baird A.H., Campbell S.J., Anggoro A.W., Ardiwijaya R.L., Fadli N., Herdiana Y., Kartawijaya T., Mahyiddin D., Mukminin A., Pardede S.T., Pratchett M.S., Rudi E., Siregar A.M. (2005) –Acehnese Reefs in the Wake of the Asian Tsunami. Current Biology 15, 1926-1930. Baumann K.H., Bockel B., Frenz M. (2004) – Coccolith contribution to South Atlantic carbonate sedimentation. InH.R. Thierstein and J.R. Young (Eds): Coccolithophores, from molecular processes to Global impact, Springer, Berlin, 367-402. Billard C., Inouye I. (2004) – What is new in coccolithophore biology? In Thierstein H.R., Young J.R. (Eds. ): Coccolithophores, from molecular processes to Global impact. Springer, Berlin, 1-29. Bown P. (Ed.) (1999) – Calcareous Nannofossil Biostratigraphy. British Micropaleontological Society Series. Kluwer Academic Publishers, Cambridge, 315 p.
Choowong M., Murakoshi N., Hisada K., Charoentitirat T., Charusiri P., Phantuwongraj S., Wongkok P., Choowong A., Subsayjun R., Chutakositkanon V., Jankaew K., Kanjanapayont P. (2008a) – Flow conditions of the 2004 Indian Ocean tsunami in Thailand, inferred from capping bedforms and sedimentary structures. Terra Nova 20, 141-149. Choowong M., Murakoshi N., Hisada K., Charusiri P., Charoentitirat T., Chutakositkanon V., Jankaew K., Kanjanapayont P., Phantuwongraj S. (2008b) – 2004 Indian Ocean tsunami inflow and outflow at Phuket, Thailand. Marine Geology 248, 179-192. 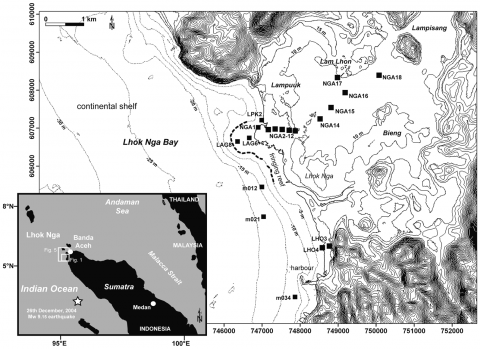 Dawson S. (2007) – Diatom biostratigraphy of tsunami deposits: examples from the 1998 Papua New Guinea tsunami. Sedimentary Geology 200, 328-335. Drago T., Freitas C., Rocha F., Cachão M., Moreno J., Naughton F., Fradique C., Araújo F., Silveira T., Oliveira A., Cascalho J., Fatela F. (2006) – Paleoenvironmental evolution of estuarine systems during the last 14000 years – the case of Douro estuary (NW Portugal). Journal of Coastal Research SI39, 186-192. Ferreira J., Cachão M. (2003) – Nanofósseis calcários em fácies costeiras: revisão de técnicas de estudo. Ciências da Terra (UNL), Lisboa, V, 76-78. Ferreira J., Cachão M. (2005) – Calcareous nannoplankton from the Guadiana estuary and Algarve continental shelf (Southern Portugal): an ecological model. Thalassas 21, 1, 35-44. Flores J.A., Sierro F.J. (1997) – Revised technique for calculation of calcareous nannofossil accumulation rates. Micropaleontology 43, 3, 321-324. Goff J., Liu P., Higman B., Morton R., Jaffe B., Fernando H., Lynett P., Fritz H., Synolakis C., Fernando S. (2006) –Sri Lanka field survey after the December 2004 Indian Ocean tsunami. Earthquake Spectra 22, S155. Guerreiro C., Cachão M., Drago T. (2005) – Calcareous nannoplankton as a tracer of the marine influence on the NW coast of Portugal over the last 14000 years. Journal of Nannoplankton Research 27, 2, 159-172. Hori K., Kuzumoto R., Hirouchi D., Umitsu M., Janjirawuttikul N., Patanakanog B. (2007) –Horizontal and vertical variations of 2004 Indian tsunami deposits: an example of two transects along the western coast of Thailand. Marine Geology 239, 163-172. Lavigne F., Paris R., Wassmer P., Gomez C., Brunstein D., Grancher D., Vautier F., Sartohadi J., Setiawan A., Gunawan T., Fachrizal Waluyo B., Mardiatno D., Widagdo A., Cahyadi R., Lespinasse N., Mahieu L. (2006) – Learning from a major disaster (Banda Aceh, December 26th, 2004): a methodology to calibrate simulation codes for tsunami inundation models. Zeitschrift für Geomorphologie, Suppl. Band 146, 253-265. 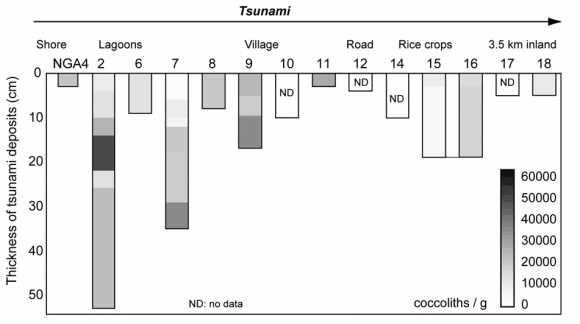 Lavigne F., Paris R., Grancher D., Wassmer P., Brunstein D., Vautier F., Leone F., Flohic F., De Coster B., Gunawan T., Gomez C., Setiawan A., Cahyadi R., Fachrizal (2009) –Reconstruction of tsunami inland propagation on December 26, 2004 in Banda Aceh, Indonesia, through field investigations. Pure and Applied Geophysics 165, 1-23. Loevenbruck A., Hébert H., Schindelé F., Sladen A., Lavigne F., Brunstein D., Wassmer P., Paris P. (2007) – Detailed modelling of the 2004 tsunami flooding in the Banda Aceh and Lhok Nga districts (Sumatra, Indonesia). American Geophysical Union Fall Meeting, San Francisco, United States of America, 10-14/12/2007. Abstract n° S53A-1042. Maeno F., Imamura F. (2007) –Numerical investigations of tsunamis generated by pyroclastic flows from the Kikai caldera, Japan. Geophysical Research Letters 34, L23303, doi:10.1029/2007GL031222. Monniot F. (1970) – Les spicules chez les Tuniciers Aplousobranches. Archives de Zoologie Expérimentale et Générale, 111, 303-311. Moore A., Nishimura Y., Gelfenbaum G., Kamataki T., Triyono R. (2006) – Sedimentary deposits of the 26 December 2004 tsunami on the northwest coast of Aceh, Indonesia. Earth Planets and Space 58, 253-258. Morton R.A., Goff J.R., Nichol S.L. (2008) – Hydrodynamic implications of textural trends in sand deposits of the 2004 tsunami in Sri Lanka. Sedimentary Geology 207, 1-4, 56-64. Nanayama F., Shigeno K. (2006) –Inflow and outflow facies from the 1993 tsunami in southwest Hokkaido. Sedimentary Geology 187, 139-158. Noda A., Katayama H., Sagayama T., Suga K., Uchida Y., Satake K., Abe K., Okamura Y. (2007) – Evaluation of tsunami impacts on shallow marine sediments: An example from the tsunami caused by the 2003 Tokachi-oki earthquake, Northern Japan. Sedimentary Geology 200, 314-327. Okada H. (1983) –Modern nannofossil assemblages in sediments of coastal and marginal seas along the western Pacific Ocean. Utrecht Micropaleontological Bulletin 30, 171-187. Paris R., Lavigne F., Wassmer P., Sartohadi J. (2007) – Coastal sedimentation associated with the December 26, 2004 in Lhok Nga, west Banda Aceh (Sumatra, Indonesia). Marine Geology 238, 93-106. Paris R., Wassmer P., Sartohadi J., Lavigne F., Barthomeuf B., Desgages É., Grancher D., Baumert P., Vautier F., Brunstein D., Gomez C. (2009) – Tsunamis as geomorphic crisis: lessons from the December 26, 2004 tsunami in Lhok Nga, west Banda Aceh (Sumatra, Indonesia). Geomorphology 104, 59-72. Passega R. (1964) – Grain size representation by CM patterns as a geological tool. Journal of Sedimentary Petrology 34, 4, 830-847. Perch-Nielsen K. (1989) – Mesozoic and Cenozoic calcareous nannofossils. In Bolli H.M., Saunders J.B., Perch-Nielsen K. (Eds. ): Plankton Stratigraphy. Vol. 1. Cambridge University Press, Cambridge, 329-554. Shields A. (1936) – Application of similarity principles and turbulence research to bed-load movement. Mitteilunger der Preussischen Versuchsanstalt für Wasserbau und Schiffbau 26, 5-24. Soulsby R.L., Whitehouse R.J.S. (1997) – Threshold of sediment motion in coastal environments. In: Pacific Coasts and Ports , 13th Australasian Coastal and Engineering Conference and 6th Australasian Port and Harbour Conference, Christchurch, New Zealand, HR Wallingford, Oxon, 149-154. Srinivasalu S., Thangadurai N., Switzer A.D., Ram Mohan V., Ayyamperumal T. (2007) –Erosion and sedimentation in Kalpakkam (N Tamil Nadu, India) from the 26th December 2004 tsunami. Marine Geology 240, 65-75. Turon X. (1986) – Morfologia de las espículas en las espécies de la família Didemnidae (Ascidiacea) del litoral de Cataluña e Islas Baleares. Miscellània Zoològica 10, 213-222. Umitsu M., Tanavud C., Patanakanog B. (2006) – Effects of landforms on tsunami flow in the plains of Banda Aceh, Indonesia, and Nam Khem, Thailand. Marine Geology 242, 141-153. Wassmer P., Baumert P., Lavigne F., Paris R., Sartohadi J. (2007) – Les transferts sédimentaires associés au tsunami du 26 décembre 2004 sur le littoral Est de Banda Aceh à Sumatra (Indonésie). Géomorphologie: relief, processus, environnement 4, 335-346. Winter A., Siesser W. (1994) – Coccolithophores. Cambridge University Press, Cambridge, 242 p.
Yalin M.S. (1972) –Mechanics of Sediment Transport. Pergamon, New York. Ziveri P., Baumann K.H., Bockel B., Bollmann J., Young J. (2004) – Biogeography of selected Holocene coccoliths in the Atlantic Ocean. In Thierstein H.R., Young J.R. (Eds. ): Coccolithophores, from molecular processes to Global impact. Springer, Berlin, 403-428. L'un des principaux enjeux actuels dans l'étude des tsunamis concerne l'interprétation de leurs dépôts et leur exploitation en terme de reconstitution des anciens tsunamis.Les principales limites demeurent la grande variabilité des dépôts sableux laissés à terre par ces événements, leur préservation, et leur distinction avec les dépôts de tempête ou ceux consécutifs des cyclones et des seiches. Les caractéristiques (amplitude, vitesse, direction, turbulence) d'un tsunami, la topographie et le contexte morphosédimentaire déterminent la répartition spatiale et les caracté­ristiques de ces dépôts. Les éléments sui­vants permettent de les distinguer d’autres dépôts, comme par exemple les dépôts de tempête : ils sont étendus à toutes les côtes d’accumulation affectées par le tsunami ; leur taille moyenne décroît généralement en fonction de l’altitude et de la distance par rapport à la côte (landward et upward ﬁning) ; on distingue souvent une stratification interne avec des unités inférieures plus grossières ; ils reposent en discontinuité sur le substratum, ce dernier présentant parfois des formes d’érosion ; la granularité varie des sables fins aux blocs plurimétriques ; ils sont riches en bioclastes (coquilles, fragments de coraux, etc. ), fragments de sol (rip-up clasts), de plantes et de bois ; les figures d’imbrication indiquent des paléo-courants dirigés à la fois vers la terre et vers la mer ainsi que des phases d'oscillation. Parmi les structures microscopiques biogéniques généralement observées dans les dépôts de tsunami, les diatomées sont couramment utilisées pour déterminer l'origine marine et les sources sédimentaires, mais très peu de travaux ont été réalisés sur d'autres marqueurs tels que les nannolithes. 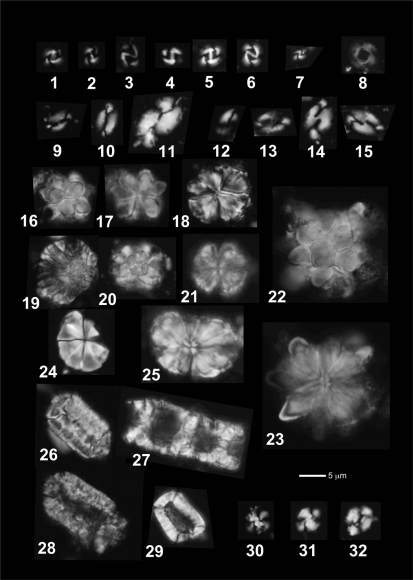 Ces derniers sont principalement composés de coccolithes, structures calcitiques complexes produites par les coccolithophores marins appartenant à la division des algues microscopiques Haptophyta. Les coccolithes sont présents en milieu océanique mais aussi côtier et peuvent donc être utilisés comme marqueurs paléoenvironnementaux et comme traceurs marins dans les sédiments côtiers. Cet article présente des données concernant l'abondance, l'origine et la répartition des nannolithes dans les dépôts du tsunami de 2004 à Lhok Nga (nord-ouest de Sumatra, Indonésie) et les implications en termes de sources sédimentaires et d'hydrodynamique. La Baie de Lhok Nga se poursuit à terre sous la forme d'une plaine littorale large de 5 km, qui a été touchée très sévèrement par le tsunami du 26 décembre 2004 et intégralement inondée (vagues de 15 m à 30 m à la côte, runups de 20 m à 50 m sur les falaises et les versants). Des relevés ont été effectués le long de transects dans les dépôts sableux du tsunami orientés dans la direction des vagues. Des relevés complémentaires ont été effectués en mer, au large et derrière les récifs frangeants. Les abondances en nannolithes ont été complétées par des analyses au calcimètre Bernard et des données granulométriques (Paris et al., 2007). La capacité du tsunami à mobiliser des sédiments au large est appréhendée par une modélisation numérique à partir des équations de Karman-Prandtle. Les résultats montrent que les dépôts du tsunami de 2004 présentent des abondances en nannolithes significativement supérieures (1,0 x 104 à 7,2 x 104 nn/g) aux autres sédiments côtiers du même secteur (4,5 x 103 nn/g) mais inférieures aux sédiments de plateforme péri-continentale (1,3 à 6,9 x 105 nn/g). Les nannolithes observés sont typiques des zones côtières peu profondes, suggérant que les sédiments plus profonds mobilisés en charge de fond par le tsunami ont été bloqués au niveau du talus continental. L'enrichissement relatif en nannolithes dans des sédiments côtiers pourrait donc représenter un outil de reconnaissance des paléo-tsunamis, même si les résultats restent préliminaires. La présence de nannolithes dans les dépôts du tsunami à Lhok Nga est surprenante du fait de la granularité des sédiments (sables moyens à grossiers, mal triés) et de leurs conditions de mise en place, peu favorables au dépôt des nannolithes. Cette relative abondance des nannolithes dans les dépôts du tsunami tend à décroître vers l'intérieur des terres et de bas en haut des coupes stratigraphiques analysées, malgré des variations liées aux phases d'érosion et de sédimentation par les vagues successives (pulsations) et aux effets topographiques, particulièrement influents lors du flux de retrait (backwash). Finalement, l'étude de la distribution verticale des nannolithes couplée à la granularité des sédiments représente une source d'information complémentaire pour l'interprétation des dépôts de tsunami. Cependant, les études à venir devront expliquer les décalages observés entre les variations de taille moyenne des dépôts, de tri granulométrique et d'abondances en nannolithes. Fig. 1 – Location of the Lhok Nga Bay and samples collected for analysis of nannoliths.Fig. 1 – Carte de localisation de la Baie de Lhok Nga et des échantillons récoltés pour l'analyse des nannolithes. Method for the construction of bathymetry (5-m dashed contour lines) and topography (10-m contour lines) is presented in F. Lavigne et al. (2006, 2009).La méthode de réalisation de la bathymétrie (équidistance 5 m, isobathes en pointillés) et de la topographie (équidistance 10 m) est présentée in F. Lavigne et al. (2006, 2009). Fig. 2 - Nannoliths observed in the 2004 tsunami deposits of the Lhok Nga Bay(calcareous nannoplankton, ascidian spicules, bryozoa fragments and reworked calcareous nannofossils).Fig. 2 – Nannolithes observés dans les dépôts du tsunami de 2004 dans la Baie de Lhok Nga (nannoplancton, spicules d’ascidies, fragments de bryozoaires et nannofossiles calcaires remaniés). All images are at the same magnification (scale bar = 5 mm) and taken under cross nicols. 1-6: Gephyrocapsa oceanica (1: sample NGA 2A; 2: sample NGA 7A; 3: sample NGA 8; 4: sample NGA 18; 5: sample LAG 6; 6: sample LAG 8). 7: Gephyrocapsa ericsonii (sample NGA 7A). 8: Umbilicosphaera sibogae (sample NGA 7A). 9-11: Helicosphaera carteri (9: sample NGA 7A; 10: sample NGA 18; 11: sample LAG 6). 12-15: Helicosphaera wallichii (12-13: sample NGA 2D; 14-15: sample LAG 6). 16-25: Ascidian spicules (16-17: distinct focal planes, sample NGA 7A; 18: sample NGA 18; 19: sample LAG 6; 20-21: distinct focal planes, sample LAG 6; 22-23: distinct focal planes, sample LAG 6; 24-25: sample LAG 8). 26–29: isolated fragments of Bryozoan carbonate skeleton (sample NGA 9A). 30–31: reworked calcareous nannofossil (Dictyococcites) (30: sample NGA 7A; 31: sample NGA 18). 32: reworked calcareous nannofossil (Watznaueria; sample NGA 2B).Toutes les images sont prises au même grossissement (échelle 5 mm). 1-6 : Gephyrocapsa oceanica (1 : échantillon NGA 2A ; 2 : échantillon NGA 7A ; 3 : échantillon NGA 8 ; 4 : échantillon NGA 18 ; 5 : échantillon LAG 6 ; 6 : échantillon LAG 8). 7 : Gephyrocapsa ericsonii (échantillon NGA 7A). 8 : Umbilicosphaera sibogae (échantillon NGA 7A). 9-11 : Helicosphaera carteri (9 : échantillon NGA 7A ; 10 : échantillon NGA 18 ; 11 : échantillon LAG 6). 12-15 : Helicosphaera wallichii (12-13 : échantillon NGA 2D ; 14-15 : échantillon LAG 6). 16-25 : spicules d'ascidie (16-17 : échantillon NGA 7A ; 18 : échantillon NGA 18 ; 19 : échantillon LAG 6 ; 20- 21 : échantillon LAG 6 ; 22-23 : échantillon LAG 6 ; 24-25 : échantillon LAG 8). 26-29 : fragments isolés de squelette carbonaté de bryozoaires (échantillon NGA 9A). 30-31 : nannofossile calcaire remanié (Dictyococcites ; 30 : échantillon NGA 7A ; 31 : échantillon NGA 18). 32 : nannofossile calcaire remanié (Watznaueria ; échantillon NGA 2B). Fig. 3 – Abundance of nannoliths and thickness of the 2004 tsunami deposits near Lampuuk (northwestern coast of Sumatra).Fig. 3 – Quantité de nannolithes et épaisseur des dépôts du tsunami de 2004 près de Lampuuk (côte nord-ouest de Sumatra). Fig. 4 – Variation of the abundance of nannoliths along cross-section of the 2004 tsunami deposits near Lampuuk (northwestern coast of Sumatra).Fig. 4 – Variation verticale de la quantité de nannolithes dans les dépôts du tsunami de 2004 près de Lampuuk (côte nord-ouest de Sumatra). Fig. 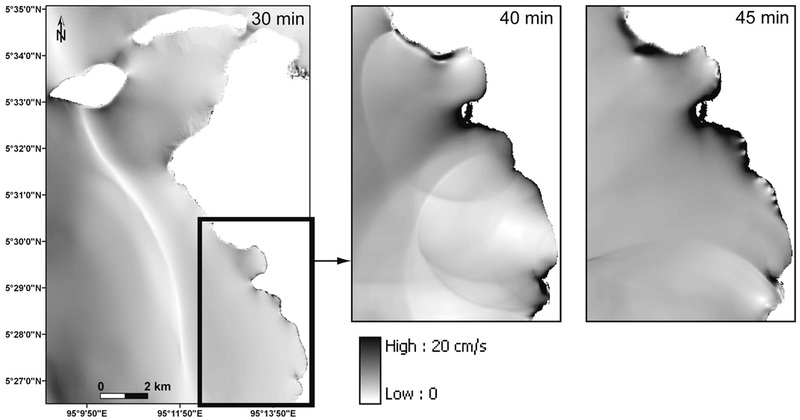 5 – Maps of threshold shear velocity values (u*) calculated for the 2004 tsunami off Lhok Nga.Fig. 5 – Cartes des vitesses de cisaillement critique (u*) calculés pour le tsunami de 2004 au large de Lhok Nga. Low values appear in blue and high values in red. 30 mn after the main earthquake, the tsunami wave train approaches Lhok Nga. u* values are already high enough (> 0.5 cm/s) to mobilize submarine sediments (u*cr of very coarse sands is ≈ 0.3 cm/s). At 40-45 mn, the tsunami has invaded the Lhok Nga Bay and high values of u* (10-20 cm/s) are observed at the coast, especially around the fringing reef in Lampuuk.Les faibles valeurs apparaissent en bleu et les fortes valeurs en rouge. 30 mn après la secousse sismique principale, le train d'onde approche de Lhok Nga. Les valeurs de u* sont déjà suffisamment élevées (> 0,5 cm/s) pour mobiliser des sédiments au fond (u*cr pour des sables grossiers ≈ 0,3 cm/s). Au bout de 40-45 mn de simulation, le tsunami a envahi les terres et de fortes valeurs de u* (10-20 cm/s) sont observées à la côte, surtout autour du récif frangeant de Lampuuk. Fig. 6 – CM patterns and nannolith abundances of the 2004 tsunami deposits in Lhok Nga.Fig. 6 – Images CM et abondances en nannolithes des dépôts du tsunami de 2004 à Lhok Nga. M50 corresponds to the median and C95 to the fifth coarsest percentile (Passega, 1964; Allen, 1971).M50 représente la médiane et C95 le 5e percentile plus grossier (Passega, 1964 ; Allen, 1971). Raphaël Paris, Mário Cachão, Jérôme Fournier and Olivier Voldoire, « Nannoliths abundance and distribution in tsunami deposits: example from the December 26, 2004 tsunami in Lhok Nga (northwest Sumatra, Indonesia) », Géomorphologie : relief, processus, environnement, vol. 16 - n° 1 | 2010, 109-118.